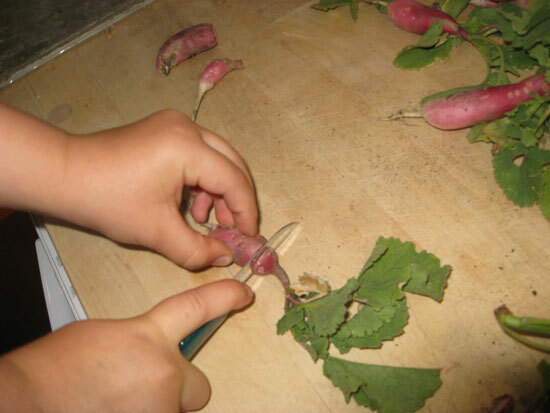 Growing radishes with children is common in preschool and elementary classrooms. They are quick to germinate, pleasing to the eye, and take only 3-6 weeks before they are ready to harvest. Perfect for impatient kids who get discouraged easily and need a positive gardening experience. 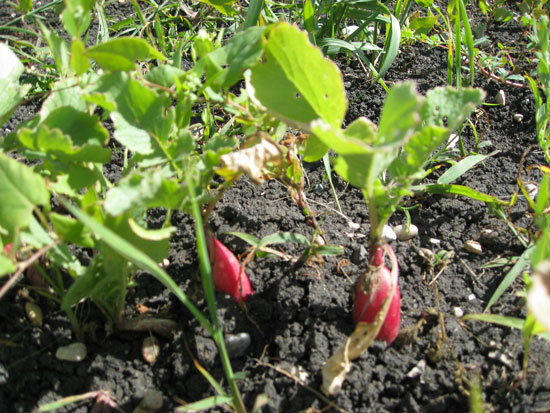 We were able to use the garden at this time of year but if you are limited a good option is to grow radishes in a container. To look at the structure of the plant underground a Root Vue Farm is the way to go. Kids Gardening has a great selection of lesson plans that can be adapted to suit your students. We love to plant radishes, although Daisy is not a huge fan of anything resembling a salad. I was determined that she enjoy the radishes she picked this year. They are perfect right now so we pulled all the largest. They are easy to pull. Apparently the young leaves can be eaten but I have never tried them. As Daisy pulled the radishes we chatted about the shape and size, roots and leaves, and what the radishes needed to make them grow. 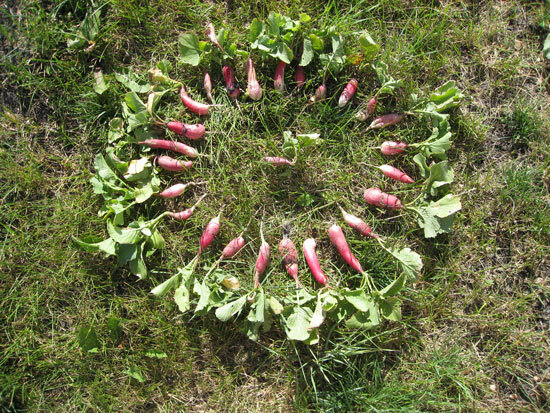 Daisy cut the leaves and roots off the radishes and then washed them. I started by giving her a blunt knife as usual but her frustration prompted me to give her a sharper knife. I supervised with care as she worked. The recipe I looked up suggested using a mandolin. 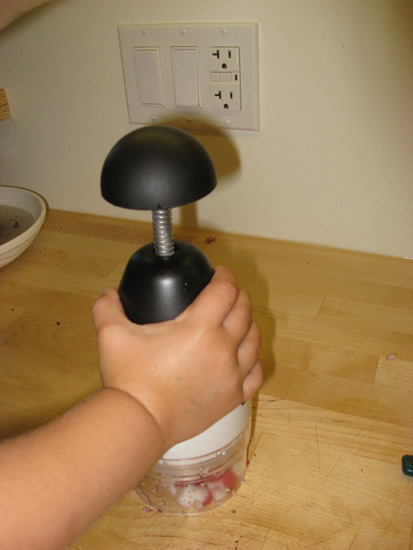 This is a kitchen tool I have always loved the thought of but certainly not one I would use with children. Using it terrifies me; therefore I have not invested in one yet. 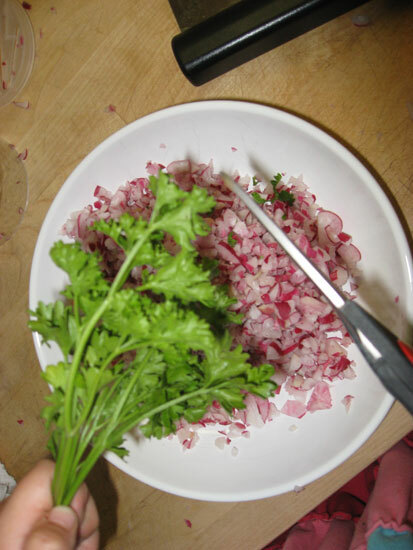 The slap chop is a hugely valuable tool in my kitchen and is used to prepare nuts, herbs, veggies, and fruit; basically anything I can think of that needs chopped up into tiny pieces. It also makes me want to reenact the commercial! Chopping anything with this tool is a huge hit with kids but they do need extra help to get the blades to reach the lower vegetables. A few slaps from mum does the job. 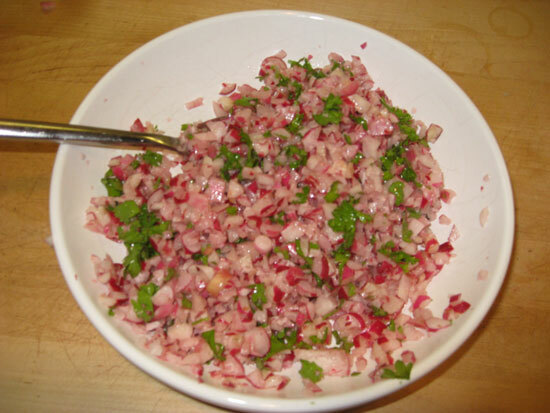 With the radishes cut up safely, we added lemon juice, olive oil and parsley we just happened to have from our vegetable share. Scissors makes chopping herbs a quick job although I did this. Daisy stirred the lot and was very happy with the finshed product. After the taste test she made a grimace so we added a pinch of sugar also. I loved this salad. Daisy on the other hand tried a little as she was proud to have made it but still found it a little bitter. I am still determined to share my love of the humble radish with Daisy so this recipe from Kalyn’s Kitchen is next on my list to try and I think cooking the radishes will make them more palatable for kids. 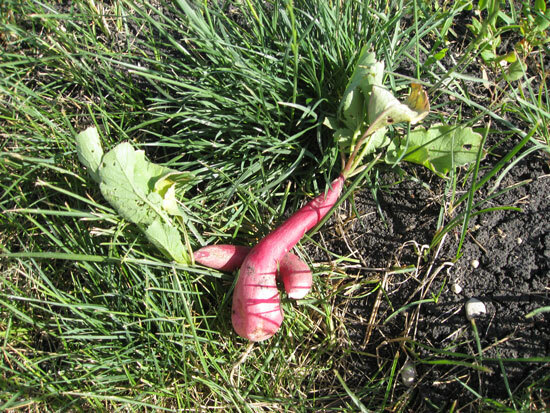 Have you any good radish recipe suggestions? Sorry – I’m with Daisy – I don’t really like radishes. Mom used to eat them whole, dipped in salt. Yikes – not for me! I will let you know what they taste like roasted; I have high hopes! !